When it comes time for refrigerator repair, you need refrigerator troubleshooting skills. Whether you own a Samsung with a bad compressor, or an LG that wont cycle off,you CAN diagnose and fix the appliance yourself. Order any necessary parts here from PartSelect and save time and money. Keep in mind that if the job involves working with freon, a licensed technician will likely be required to do that part of the job. Whenever one of your kitchen appliances has mechanical or performance issues, the first step is to discover the root cause of the problem instead of simply running out to purchase a new one. This process is generally rather straightforward. All youll need is a few basic tools, some mechanical and HVAC skills, and a handy checklist. Read on; this article will provide the checklist to use for troubleshooting refrigerators; print it out for reference. This guide is rather generic since all major brand names work more or less the same way, even though high-end models have several more bells and whistles, like ice makers and filtered water dispensers. As a matter of fact, they have a lot in common with your central air conditioner. If you get stumped or have a refrigerant issue youll need a licensed service person. To find a company in your area thats been rated by your neighbors, I recommend Angie's List. Tip: Any DIYer not comfortable working with electricity should call an electrician. Is there no power to the fridge? Make sure that its plugged in and check the circuit breaker. Is your temperature control knob turned off or too far down? Adjust it. Is your compressor overheating? Clean your condenser coils. Compressor defective? Call service company. The new one will need a refrigerant charge. Is your condenser fan defective? Replace it or call a service company. Is your temperature controller defective? Test the control. How about the defrost timer? Test it and replace if needed. Do you have a defective overload protector? Replace it yourself or call a service company. Is the overload protector tripping too quickly? Check the voltage at the outlet. Compressor defective? Call service company. Condenser coils dirty? Clean the coils. Check the temperature control knob and adjust if needed. 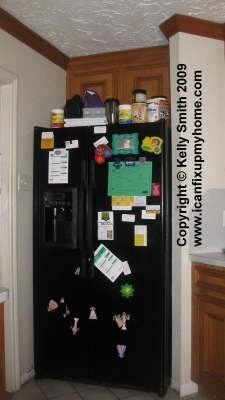 Do you suspect a refrigerator refrigerant leak and/or contamination? Call a service company. Is the door closing completely? Refrigerators doors are engineered to close automatically from the half-open point. Raise the front leveler adjusters until it closes properly. Do you have dirty condenser coils? Clean the coils. Test your evaporator fan. If its faulty, replace it yourself or call a service company. Evaporator jammed up with ice? Defrost the fridge, test the defrost timer, test the defrost limiting switch, and finally test the defrost heater. Has your door seal seen better days? Test around the door by closing the door on a sheet of paper. Do you feel plenty of tension when you pull it out? If you dont, replace it with a new properly sized gasket. Is your temperature control knob set too cold? Adjust it. Is your temperature controller defective? Test the control and replace if needed. This might be the door seal. Test around the door by closing the door on a sheet of paper. Do you feel plenty of tension when you pull it out? If you dont, replace it with a new properly sized gasket. Are the condenser coils dirty? Clean the coils. Do you see a frost build-up? Defrost the refrigerator. If your fridge has an exposed evaporator plate or coils and theyre dirty, clean them up with warm soapy water.